Despite having an eReader, I greatly prefer reading print books. However, I hate to see old books end up in the trash. One solution is to resell them at used bookstores, like the one we have at my local library. 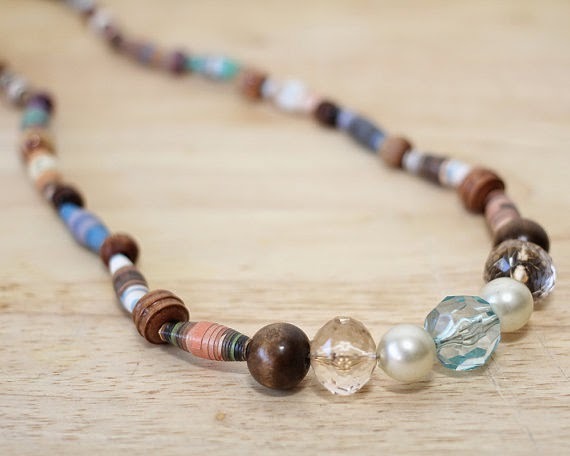 However, Trashy Crafter has come up with another solution for old books: make jewelry! 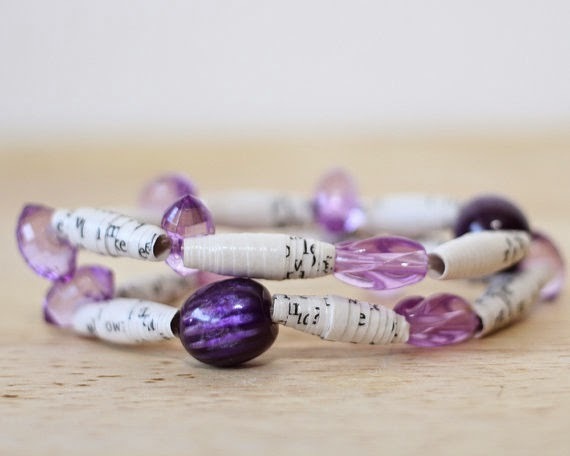 This mother/daughter team takes damaged and outdated books and turns them into beautiful bracelets, necklaces, earrings and lanyards. 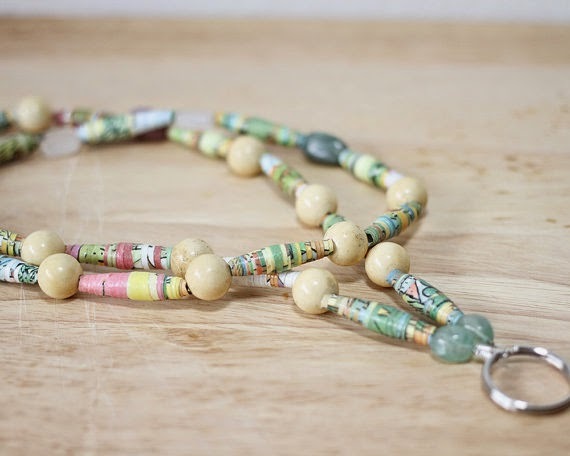 They do this by removing pages from old or damaged books, cutting them into strips, and rolling them into beads. 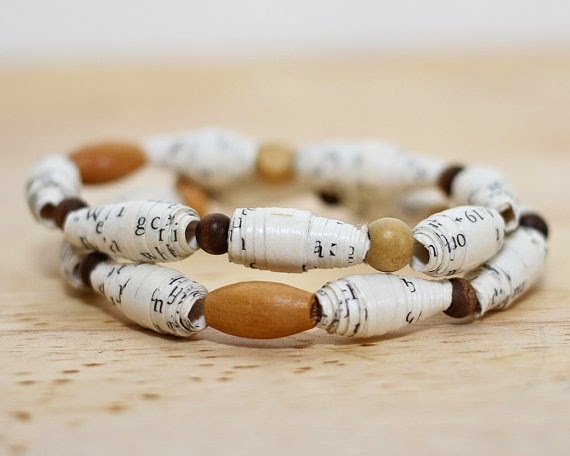 It’s also a lot of fun because you can wear reminders of your favorite reads! As you can see, the bracelets come with 2 or 3 pieces. There are also earrings, necklaces, and lanyards like those featured below. These items are so unique and pretty. They make great gifts for people who love to read! 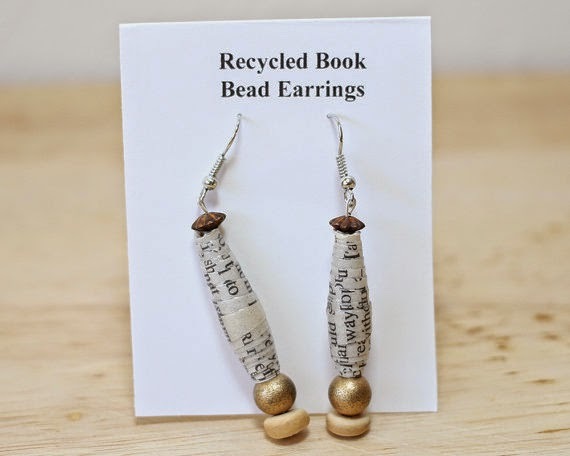 I hope you’ll check out the recycled book jewelry at www.etsy.com/shop/TrashyCrafter. Valentine’s Day and Mother’s Day are coming up. Use the Discount Code below to receive 15% off your purchase! Use the code onparenting at checkout and receive 15% off your order! Hurry, it will expire in 30 days! 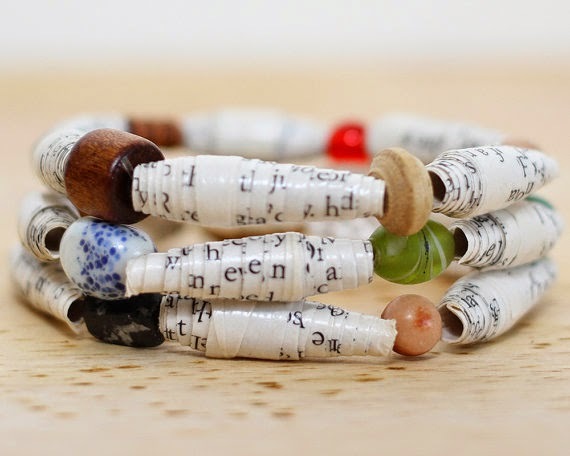 One lucky winner will receive a 2-piece recycled book bracelet from Trashy Crafter! Enter through the Rafflecopter form below. This giveaway is open to U.S. residents and ends on Wednesday, February 11, 2015 at 11:59 PM EST. 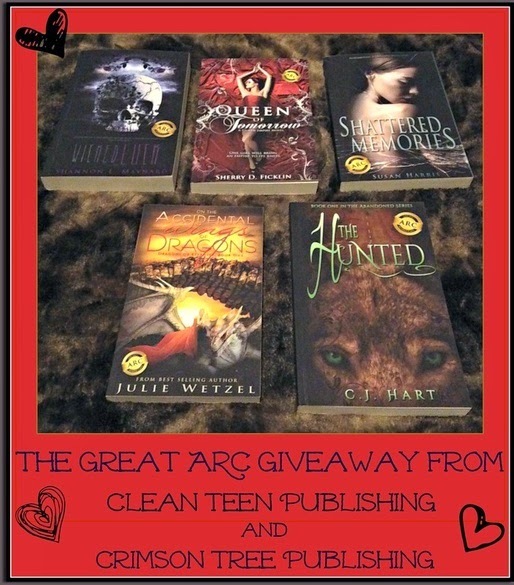 Clean Teen Publishing and Crimson Tree Publishing are giving away print ARCs (advance reader's copies) of the following titles! The giveaway ends on January 30, 2015, so be sure to enter soon. I feel another heavy sigh within me. I wish I could say it feels like a burden removed, but it does not. It feels like the weight of a pyramid on my soul. Is that the weight of a lifetime of memories that I’m not ready to part with? I don’t want to go. I want to stay and see Emma and Kevin grow old; see my grandchildren grow up and prosper. But I know it is not to be. And while I accept that, I sure don’t have to like it. My lips are so dry. I am so thirsty. As I think this, I see Christ on the cross. He too was thirsty. I get it now. It’s not an intellectual understanding. It’s a reaffirmation. Death comes to us all and we cannot hide. I am so tired. The room begins to shift and shape itself. Voices are becoming slow and hard to understand. The room seems to be growing more distant, elongated with furniture and people falling away from me. My children seem to be sliding away from me. Why do they seem so small–have I gotten bigger? With every ounce of strength I still possess, I force my eyes open. Faces blur and it is hard to refocus. Voices are now distorted, slow and monosyllabic. I reach for my babies’ hands, but they keep moving further away and I cannot grab them. I cannot pull them to me. I am frenetic, clawing in my efforts to reach them, but they recede further and further until I can see them no more. The excruciating horror of this reality is upon me. The pain of this sudden and irrevocable separation is almost unbearable for me. I scream silently that I am not ready–that I want to stay–I will do anything, trade anything. I try to barter with God, but it is in vain. My children are lost to me. The world is lost to me. Kathi Haacke Morehead makes her fiction debut with WHITE NIGHT. She is the author of HEART BLEED: Letting Go and Stanching the Flow, and THE BEST FROM THE CHEAP SEATS. She has also written numerous articles for Mind Body Green and Boomeon. She blogs daily at A View From the Cheap Seats Today. Kathi lives in Brunswick with her husband Dave and their four finicky felines. Her motto is "love and laugh!" Spotlight on Whiskey Witches, by S.M. Blooding: Read an Excerpt! Like the sacrificial murders of St. Francisville, Louisiana. There’s a killer on the loose, choosing people in a vain attempt to raise a demon. Not just any demon, though. A man born long ago, made a demon in order to protect the Gate to Hell. Together with demon hunter, Dexx Colt, her kitchen-witch grandmother, and her paranormal investigator brother-in-law, they unravel a conspiracy far bigger than a few simple murders, and re-discover Paige’s gift. She’s a demon summoner, and she’s key to the killer’s plan. Enjoy the following excerpt from Whiskey Witches! The Mel read at a point two. Nothing. She listened to the silence. Something scraped against the roof. Something scurried across the shingles. A box shifted across the floor on the opposite side of the room. She straightened, instantly alert. “Tag this. Something just called my name. Dexx, if this is you, come out.” Though she hadn’t heard anyone clomp up those wooden stairs. They weren’t quiet steps. Something slid in front of her. She heard it. It sounded heavy like a dresser, maybe? Wood on wood? It wasn’t a box, at least not a cardboard one. She set the Mel down. She needed light and the only thing she had was the flashlight on her key ring. She dragged herself to her feet and shuffled in that direction, flashlight in one hand, voice recorder in the other. The floorboards creaked under her weight. She peered around a stack of cardboard boxes. The attic door slammed shut. A furious force pushed against her. She stumbled as she raised her arms above her head. Something dragged her toward the now open door, hands like icy fire scalding her forearms. Her fingers latched onto the door, closing it on her way through. The force continued to pull her down the tight attic stairs. Her foot twisted. She grabbed at the wall, the railing, anything. She landed on her back and slid down the remaining three stairs, thunking her head against each one on her way down. Her hand caught the banister and she laid there, feeling every step digging into her. She’d lost the voice recorder. Her keys and flashlight were gone too, who knew where. She took in a deep breath and slowly sat up, closing her eyes momentarily. As they opened, the flashlight turned itself on. Three steps below her. Her heart froze. The only way to turn the light on was to hold the button. It stuttered and shut off. SM “Frankie” Blooding lives in Colorado with her pet rock, Rockie, and Jack the Bird. Jack has refused to let her to take up the piano again, but is warming to the guitar. It might help that Frankie has learned more than two strings. She’s added a few more Arabic words to her vocabulary, but don’t invite her into conversation yet -- unless, of course, you’re willing to have a very ... slow ... conversation. Travel back in time to the U.S. Capitol and the Library of Congress in Elizabeth Camden's newest release, Beyond All Dreams. From the gilded halls of the Capitol where powerful men shape the future of the nation, to the scholarly archives of the nation's finest library, Anna and Luke are soon embroiled in secrets much bigger and more perilous than they ever imagined. Is bringing the truth to light worth risking all they've ever dreamed for their futures? Enter today by clicking the icon below. But hurry, the giveaway ends on 2/17. Winner will be announced at Elizabeth's 2/17 Beyond All Dreams Facebook author chat party. RSVP for a chance to connect with Elizabeth and historical fiction fans, as well as for the opportunity to win some great prizes! Divorced mother, Allie Emerson, never imagined she’d be raising two teenage girls on her own. Between parenting and paying the bills, she hasn’t even thought about meeting a man. That changes once she hears local carpenter, Braden Fox, is in need of a secretary. Back in high school, Allie had done all she could to deny the sparks burning between her and Braden; perhaps now they could explore the possibilities. Braden has heard all about what Terrance did to Allie and the girls, has been planning to stop by and see how she’s getting along, but Allie beats him to it by showing up at his shop in search of a job. Her single visit reignites the old flame Braden used to torch for her; trouble is, old feelings of resentment return as well. Allie did choose Terrance over him, after all. And as much as Braden wants Allie in his life, he’s not sure he can open his heart again. With this second chance at romance, will the bumps in their relationship be too much to get over, or will this carpenter learn to smooth out the past? Their eyes met once more, and a shot of heat flooded his chest like a liquid bolt of lightning, forcing his pulse to rush. “I’ve missed you,” he blurted. Writing Romance That's Clean Without Losing the Steam! I'm a reader of good, clean romance, a lover of family time and Diet Coke, and the ultimate hater of laundry. I'm not patient enough to enjoy yoga, or tall enough to be great at basketball, but I do love to run -- anywhere but on a treadmill. I love the sound of a rainstorm when I have no place to go, the feel of SoftLips chapstick on my lips, and the first peek of blue water as we round the mountains toward our favorite getaway in Bear Lake. Cecily Faire has a secret, but when she arrives at Willowgrove Hall to serve as a lady’s companion, she comes face-to-face with the only person who knows the truth about her past. As the steward of Willowgrove Hall, nothing escapes Nathaniel Stanton’s notice, including the beautiful new lady’s companion. But Nathaniel has a secret of his own: he is the illegitimate son of Willowgrove’s former master. When Willowgrove’s mistress dies, everything changes. Cecily and Nathaniel are forced to make decisions that will change the course of their lives. Can they forge a future together despite their secrets? I've been wanting to read Sarah E. Ladd's historical romances for a long time, so I was thrilled to finally have the opportunity to read A Lady at Willowgrove Hall. This book has everything you would expect in historical fiction: mystery, secret pasts, forbidden love, a young woman in peril -- all in a historical setting. Cecily's secret would not be a big deal in modern times, but in the early 1800s, it could ruin multiple lives. Motherless and with a heartless father, Cecily must forge through life alone after losing contact with her twin sister. I love Cecily's spunkiness and drive to overcome her past and better her life. And Nathaniel is a kind and hard-working man who is loyal to his family and his employer. I was rooting for Cecily and Nathaniel to risk their budding romance by unburdening themselves of their secrets in the hopes of establishing an honest relationship. I loved the characters, story and setting in A Lady at Willowgrove Hall, and I'm anxious to read more of Sarah E. Ladd's historical novels. Disclosure: The publisher has provided me with a complimentary copy of this book through BookLook Bloggers for my honest review. All opinions are 100% my own. "Powell does a masterful job. Highly recommended." E.M. Powell is the author of medieval thriller THE FIFTH KNIGHT, which was a #1 Amazon bestseller. Born and raised in the Republic of Ireland into the family of Michael Collins (the legendary revolutionary and founder of the Irish Free State), she now lives in the northwest of England with her husband and daughter and a Facebook-friendly dog. She is a member of the Historical Novel Society, International Thriller Writers and Romance Writers of America. She is a reviewer of fiction and non-fiction for the HNS. Find out more by visiting www.empowell.com. You can also connect with her on Facebook, Twitter, and Goodreads. Welcome to the blog tour for Wedding Cake, by Josi S. Kilpack. Read on to learn more about this book and author, read an excerpt, and enter to win a $25 Amazon gift card or PayPal cash! After years of mysteries, murder, and mayhem, the big day has arrived, and Sadie wants nothing more than for her wedding to Pete to be completely uneventful. When she receives a threatening, anonymous text message just days before the ceremony, she's determined not to let it interfere with the celebration she has carefully planned for months. But as the threat escalates from a distant fear to a frightening reality, Sadie realizes just how much she's underestimated the situation. Desperate to put an end to the games, lies, and manipulation that have shadowed her life, Sadie, her fiancé, Pete, and her children pull out all the stops. What they don't know, however, is just how far Sadie's nemesis is willing to go to make good on the threat she made to Sadie three years ago. Will the wedding go off without a hitch, or will "'til death do us part" come far too soon? There's no turning back for anyone in the riveting conclusion to this twelve-volume culinary mystery series. It took half of a sleeping pill and twenty minutes of soothing rain sounds from an app on Shawn’s phone before Sadie fell asleep. She’d used her headphones so as not to disturb Shawn but woke up around five o’clock tangled in the headphone cord that she thought was rope for a frightening few moments. She couldn't breathe, couldn't think of anything other than the fact that she was trapped, that Jane had somehow won. The terror kept her frozen until she awakened enough to realize she was as safe as she’d ever been. After disentangling herself from the headphones and thinking calming thoughts in order to get her heart rate back to normal, she put her legs over the side of the bed and sat up in hopes it would help clear her head from the leftover fog of the prescription medication she hadn't used in months. The silver dawn of morning peeked through the gaps around the curtain, outlining Shawn’s mountainous form in the other bed. She stretched and blinked and only then did she remember everything. The subconscious hope of a new day was smothered and choked. Josi S. Kilpack hated to read until her mother handed her a copy of The Witch of Blackbird Pond when she was 13. From that day forward, she read everything she could get her hands on and accredits her writing “education” to the many novels she has “studied” since then. She began writing her first novel in 1998 and never stopped. Her novel, Sheep’s Clothing, won the Whitney Award 2007 for Mystery/Suspense. Lemon Tart, the first book in the Sadie Hoffmiller Culinary Mystery series, was a finalist in 2009. Josi currently lives in Willard, Utah, with her husband, children and super-cute cat. In a village of masked men, each loves only one woman and must follow the commands of his “goddess” without question. A woman may reject the only man who will love her if she pleases, but she will be alone forever. And a man must stay masked until his goddess returns his love -- and if she can’t or won’t, he remains masked forever. Where the rest of her village celebrates this mystery that binds men and women together, seventeen-year-old Noll is just done with it. She’s lost all her childhood friends as they’ve paired off, but the worst blow was when her closest companion, Jurij, finds his goddess in Noll’s own sister. Desperate to find a way to break this ancient spell, Noll instead discovers why no man has ever loved her: she is, in fact, the goddess of the mysterious lord of the village, a Byronic man who refuses to let Noll have her right as a woman to spurn him and who has the power to fight the curse. Thus begins a dangerous game between the two: the choice of woman versus the magic of man. And the stakes are no less than freedom and happiness, life and death -- and neither Noll nor the veiled man is willing to lose. Amy McNulty is a freelance writer and editor from Wisconsin with an honors degree in English. She was first published in a national scholarly journal (The Concord Review) while in high school and currently spends her days alternatively writing on business and marketing topics, and primarily crafting stories with dastardly villains and antiheroes set in fantastical medieval settings. After a failed dig in Honduras, aspiring archaeologist Casper Christiansen heads home to Minnesota to face his unresolved feelings for Raina Beaumont, the woman of his dreams. But when he arrives unannounced on her doorstep, he receives the shock of a lifetime: Raina is pregnant with someone else's baby. Heartbroken, especially when he discovers the identity of the baby's father, Casper tables his dreams and determines to be dependable for once, helping his older brother, Darek, prepare the family resort for its grand reopening. Casper longs to be the hero of at least one family story, but a never-ending Deep Haven winter and costly repairs threaten their efforts -- and the future of the resort. Worse, one of Casper's new jobs constantly brings him into contact with Raina, whom he can't seem to forget. A tentative friendship begins to heal fresh wounds, but can they possibly overcome past mistakes and current choices to discover a future together? I have read several books in the Christiansen Family series of novels, so I was really excited to read about more of the family members. This story is really about unrealized dreams. Casper is disappointed that he didn't find the treasure he sought, while Darek feels unequal to the task of saving the family resort, parenting his child, and being a good husband to his pregnant wife. Of course, both men have a lot to learn about what's important in life. It's also a story about pride. Casper isn't sure he can forgive Raina for her betrayal, while Darek feels less than a man due to his perceived failings as the head of his family. It takes a lot of missteps before they come to find that their definition of success was faulty. I loved seeing how all of the characters in this novel grew emotionally. Raina, especially, had a lot of wounds to heal thanks to a very difficult childhood, during which she blamed herself for the early deaths of her mother and brother. Then she messed up her life again when she became pregnant as the result of a one-night stand and sought stability with a man who attempted to control her. Obviously, the Christiansens are realistic, with the faults and mistakes that all of us carry through life. Ultimately, Always on My Mind is a story of hope, showing us that we can rebound from a difficult past and poor choices to become the person that God intended us to be. Tristan Johnson is not an easy guy to get to know. He’s quiet, shy, and borderline elusive. That never stopped Samara Cavanaugh from claiming Tristan as her best friend, her tutor, her longtime crush. She knows Tristan better than anyone. Sam was the one person that Tristan had allowed himself to get close to. But even Sam wasn’t aware of the secrets her best friend had been keeping. When Sam’s life was in jeopardy Tristan didn’t hesitate to protect her. Now that he’s gone, Sam will do whatever it takes to get him back. Samara Cavanaugh has grown up in a world filled with magic users. She’s used to bizarre and peculiar. But when a stranger checks in at The Bella Luna, the bed and breakfast her family owns, the strange occurrences in Granite Falls escalate. Many people are leery of Levi, their new guest. He claims to be in town doing research but Samara’s friends aren’t so sure that his claim is as innocuous as it appears to be. When two of her classmates disappear, her friends seem convinced Levi had a hand in it. Those closest to her have been keeping secrets from her. Those secrets put everyone close to her in danger. Suddenly, her unrequited crush on her best friend, Tristan becomes the least of her troubles. Enter to win a $25 Amazon Gift Card. Giveaway ends 1/31/15 at 11:59 pm EST. Enter through the Rafflecopter form below.